Jeremy Larkin stiff-arms a defender. 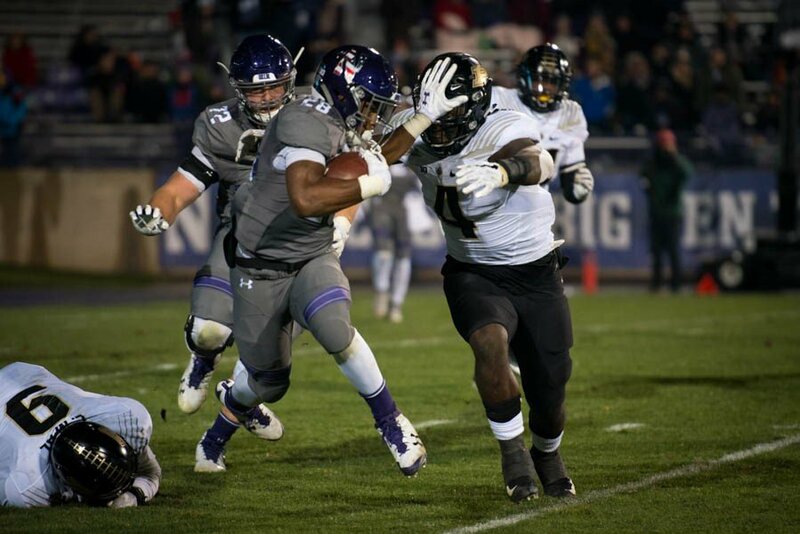 The redshirt freshman running back and Northwestern topped Purdue on Saturday night. Northwestern broke one streak Saturday against Purdue, but kept alive the one that matters. After three straight weeks of heartstopping overtime victories, the No. 25 Wildcats (7-3, 5-2 Big Ten) took an easier route to victory over the Boilermakers (4-6, 2-5). NU controlled play on the way to a 20-0 lead in the third quarter and eased into a 23-13 win, the team’s fifth straight, as regulation expired. Though this contest didn’t require extra time, Purdue managed to keep things interesting late in the game, racking up passing yards against soft coverage from the Cats. But NU did enough defensively to keep the visitors at bay, never allowing the lead to shrink below two scores in the second half. On the other side, the Cats’ offense took time to get going on a cold November evening. The team came away from its first four possessions empty-handed, including two missed fourth-down attempts to end drives. An apparent punt return touchdown from redshirt freshman Riley Lees was set to put the hosts on the board early in the second quarter, only for the play to be called back by a controversial penalty along the sideline. But the return seemed to ignite NU’s offense, which marched down the field and scored the game’s opening points on a scramble into the end zone by junior quarterback Clayton Thorson. The Boilermakers bottled up the Cats’ run game all evening, with senior running back Justin Jackson managing just 46 yards on the ground. In response, the Cats turned to Thorson, who put up 296 yards through the air on 46 attempts. His connection with sophomore wideout Ben Skowronek was particularly fruitful, as the receiver snagged seven catches for 117 yards. His 11-yard catch over a defender in the back of the end zone capped a two-minute drill and put NU in the driver’s seat, up 14-0 at halftime. After the break, the Cats tacked on three more field goals, coming up short several times in the red zone. The onus shifted to NU’s defense, shorthanded after a targeting ejection of junior cornerback Montre Hartage and an injury to junior safety Jared McGee, to see the game out. It wasn’t always pretty, as Purdue quarterback Elijah Sindelar piled up 376 yards through the air. The Boilermakers scored a pair of second-half touchdowns to cut the score to 23-13 with more than five minutes remaining, burning a conservative Cats defense on multiple occasions. But NU came up with a fourth-down stop near midfield early in the fourth quarter, then forced another punt from roughly the same area on the next drive, to put Purdue’s late comeback attempt on life support. Sindelar’s final pass was intercepted by senior cornerback Marcus McShepard with under a minute remaining, icing a win that keeps the Cats rolling for another week.